Guest CoHost Emily Gerde presents Ryan Ott. He is a professional builder and has helped many people to fulfill their dream to build a tiny home. In this interview, we learn about the cost involved in building a tiny home and much, much more. If you are dreaming to own one in the future, this podcast will prepare you to ask all the right questions and make a plan before you spend any money. Best to do it right from the beginning. Ryan Ott is the owner of Midwest Tiny Living LLC. Based in Minnesota, Ryan brings a lifetime of experience and experiments to the tiny house community. His approach is to custom build tiny homes for the clients he serves which helps them make the transition in a way that works best for them. This technique, he feels, is the best way to ensure a successful transition from living in large rooms to living in a large world. We discuss all things tiny houses including pricing, planning, building, and parking. 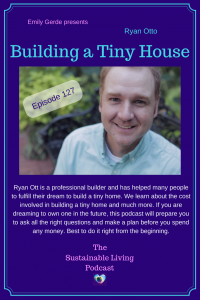 Ryan gives us an insider view of tiny house building and inspires us to think about the tiny house movement as a bigger goal of home ownership. Ryan gives practical advice on how to plan efficiently and what to consider before finalizing your design. He does a great job explaining the difference between RV’s (which I accidentally call mobile homes), and tiny houses. From insulation to size and practicality, Ryan gives us the insight you need to make an informed decision about building a tiny house. With personal experience in living in a tiny house and camper, I can attest to his assessment of the pros and cons to both. We dive into what it takes to make a tiny house and why prices vary from state to state. There is a growing confusion with tiny houses prices with most information coming from tiny house television shows. Ryan gives a step-by-step explanation of the cost of materials and how quickly they add up but also assures potential tiny homeowners costs can be decreased easily with used materials, sweat equity, fewer windows, smaller trailer and used appliances. 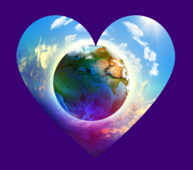 He encourages you to build to the 98% of your life, by making sure your daily needs are met. He gives a great example of a bathtub being an unnecessary item if you take a bath twice a year or a huge kitchen if you only seat more than a few people on holidays. His practical planning advice will assure you design and build the tiny home that best fits your needs and wants. Financial freedom is a big part of the discussion as we discuss how tiny houses will save you a lot of money in the long run with no mortgage, small utility bills and low maintenance costs. Tiny homes are one piece of the puzzle for finding new ways to offer affordable houses. This may require some trailblazers to get zoning regulations changed in their area, as well as finding ways to build them up to a specific code to allow more parking spot options. When it comes to parking Ryan believes we all deserve to follow our dreams and live where we want to live and thrive. I am so happy to tell you all that Emily Gerde is the first guest co-host joining our team. As you know by now, Jenise has too many obligations and has decided to leave the world of podcasting for a bit. We still hope to hear from her in the future.